Would Hal Jordan really go insane at the destruction of Coast City? I use to believe this but after 10+ years of aguements & discussions I find myself 70/30 on the subject so now i have a final solution to the question. I have decided to let my physic teacher(20yrs in the business) read all of vol.3 and emerald twilight. I will post the respond when i get it. 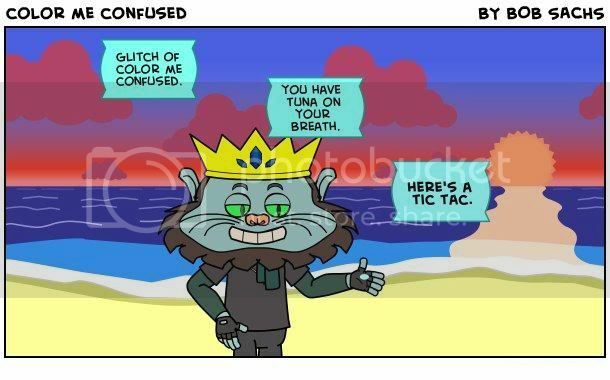 It wasn't so much Coast City itself making himself insane as much as it was the Guardians sticking it to him right after Coast City, while he was in the middle of coping... like, the straw that broke the camel's back. Ganthet has -- on at least a couple of occasions -- admitted the Guardians did very wrong by Hal. People all over the world have been driven insane by far less. I think it is not insignificant to note that the writer of GL at the time of Coast City's destruction, who presumably had a lot to say about the mental strength of the character, did NOT feel that Coast City's destruction would drive Hal insane. We know this because he had a script for events post-Coast City that did not include a descent into insanity. To me, the fact that that event was latched on to after the fact as something to point to and say, "Yeah, that's why he went insane. That's the ticket!" says a lot about why it simply wasn't believable. If you are going to tell a decent story about a character going nuts, I think you really NEED to PLAN it that way, including the trigger in your story arc, not just picking something that was never intended to drive the character insane and retroactively saying that it did. There were several ways in which the destruction of Coast City could have been PLANNED to be more tragic for Hal, and more believable for a trigger for a descent into insanity that they had planned, but since it was never intended for that purpose, none of that happened, and we got, IMHO, a very weak explanation for a very serious, sudden, and severe psychotic break. People with the established mental strength and track record of dealing with tragedy that Hal Jordan had? I kind of doubt it. I have no doubt that Hal Jordan has a breaking point. I think EVERYBODY does. I just don't think that Coast City's destruction as it happened was sufficient. Last edited by Parrylakks; 10-19-2007 at 10:34 PM. Hal had something inside him when he lost it ... Under normal non Parallax circumstances, I don't think Hal would have snapped though ... Since Parallax was involved though, I find the story very believable now ... At first, I didn't know Parallax was an actual seperate being ... I thought Hal simply snapped and started calling himself Parallax ... It'd kinda be like me suddenly changing my name to Shirley with no explanation, except that Jesus didn't come down from the cross in Spiderman 3, and honor Brock's request to kill Peter Parker ... Ya know ??? It'd kinda be like me suddenly changing my name to Shirley with no explanation, except that Jesus didn't come down from the cross in Spiderman 3, and honor Brock's request to kill Peter Parker ... Ya know ??? Wow... thats just umm... wow... wtf? Well, as long as its working out for ya. I have to admit that the very first issue I read of Green Lantern was Volume 3, Number 48. I was ten years old. I have been reading GL non stop ever since. I've loved every minute of it and I'm still enjoying the ride. I don't think I would have had them change it for anything. I was a Hal fan at first, but grew up with Kyle. I loved when they made Hal the Spectre and Kyle the Torch Bearer of the Corps. Making him Ion and bringing back the Corps was the best thing that ever happened. Then they brought back Hal. Now I have the best of both worlds ring slinging together with John and Guy. Where they all belong. Never made sense to me Hal's great willpower is what makes him a great hero, for him to snap out of no where change his name start killing his friends and try and reboot the universe is a big WTF? for most Hal fans. Hal IS Human after all people make mistakes, give in and fall. but theres always the time to rise up and be the hero again , and i hope DC wont do this kind of thing to anyone .. I just hope that no other Earth GL is introduced in the future , Ever.. I agree with ya ... Artists and writers sometimes feel they can't do anything new or fresh with existing characters, so they use the excuse of "trying to win new fans" for creating new characters ... Sometimes, they do get it right like in the cases of Kyle Rayner, Tim Drake, and a few others ... Since I brought up Tim Drake, please let me cite two other examples from the Batman mythos ... Where's Azrael now ??? Who really cares about Jason Todd anymore ??? I wish I knew. I rather liked Jean Paul Valley. Last edited by Superlantern; 10-26-2007 at 04:41 PM. There are a couple of differences. One, the Guardians were gone at that point, or at least all but one, and the one that was left was a bit odd. Two, Kilowog actually SAVED the life-essences of his race in his ring. I don't think the Guardians have any problem with SAVING lives. He, and some other GLs, then Bolovax-formed a planet for them to live on, so he could release them from his ring. When Hal intitially caught flak from the Guardians, he was ringing up a big, fake Coast City, with fake inhabitants to make his mentally unhinged self feel better. It can be argued that this form of dealing with his grief was beneficial (I think it was drawing him further and further from reality, but the argument can be made), but it was mainly a personal benfit, and wasn't REALLY saving any lives, or even bringing any back, which is, presumably why they didn't like it (though their callousness and poor timing seemed, IMHO, to have been exaggerated for that scene, because the story required Hal to get really mad at them right then). ... he wanted to make things right. Not just Coast City... but what he had done within his emotionally stressed outrage. Hal didn't go insane... he just snapped very briefly. That is why the whole idea of the bug is flawed. He wasn't really a bad guy... he was just doing things to fix others, and in order to fix things, he realized he had to rewrite history... he had to remake the universe. It wasn't really out of his reach... he just never accomplished it. He wasn't ever a true bad guy... and thats why the fear bug was a terrible idea. Parrylakks, the way you describe Hal as Parallax is the way I *wish* they had always done it. Unfortunately, there were too many times (especially "Zero Hour") where Hal was depicted as just off his rocker. Even as he flew towards Oa in "Emerald Twilight", he seemed to relish in the decimation of his corpsmen. If they had just depicted Hal as a hero who crossed the line and was taking extreme actions to right a wrong, it would've worked and been more tragic but i feel some creators treated him as an out and out power mad lunatic and others overused his "I just want to make things right" mantra to the point where he seemed adle-minded. 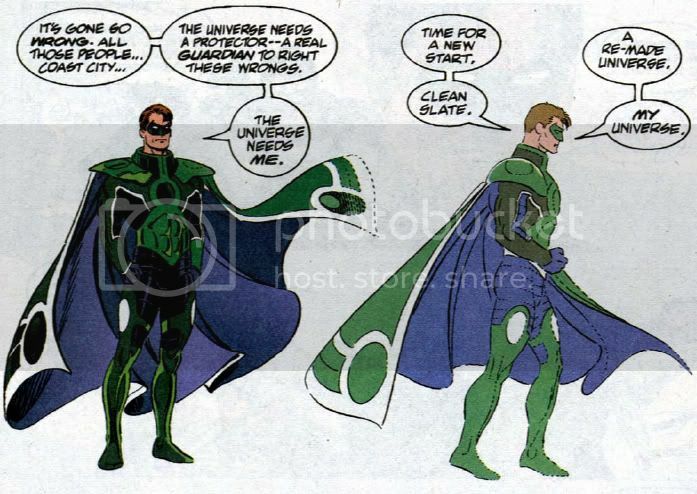 There were a few appearances that showed how Hal could've continued to be an interesting presence in the DCU as a morally ambigous figure, but I feel DC failed to live up to it or just wasn't really sure what Parallax was supposed to be. Last edited by Kane2814; 11-07-2007 at 05:53 AM.